BackgroundTrigeminal neuralgia is accompanied by severe mechanical, thermal and chemical hypersensitivity of the orofacial area innervated by neurons of trigeminal ganglion (TG). We examined the role of the voltage-gated sodium channel subtype Nav1.9 in the development of trigeminal neuralgia.ResultsWe found that Nav1.9 is required for the development of both thermal and mechanical hypersensitivity induced by constriction of the infraorbital nerve (CION). The CION model does not induce change on Nav1.9 mRNA expression in the ipsilateral TG neurons when evaluated 9 days after surgery.ConclusionsThese results demonstrate that Nav1.9 channels play a critical role in the development of orofacial neuropathic pain. New routes for the treatment of orofacial neuropathic pain focussing on regulation of the voltage-gated Nav1.9 sodium channel activity should be investigated. A tetrodotoxin-resistant voltage-gated sodium channel expressed by sensory neurons. Dorsal root ganglion sensory neurons associated with C-fibres, many of which are activated by tissue-damage, express an unusual voltage-gated sodium channel that is resistant to tetrodotoxin. We report here that we have identified a 1,957 amino-acid sodium channel in these cells that shows 65% identity with the rat cardiac tetrodotoxin-insensitive sodium channel, and is not expressed in other peripheral and central neurons, glia or non-neuronal tissues. In situ hybridization shows that the channel is expressed only by small-diameter sensory neurons in neonatal and adult dorsal root and trigeminal ganglia. The channel is resistant to tetrodotoxin when expressed in Xenopus oocytes. The electrophysiological and pharmacological properties of the expressed channel are similar to those described for the small-diameter sensory neuron tetrodotoxin-resistant sodium channels. As some noxious input into the spinal cord is resistant to tetrodotoxin, block of expression or function of such a C-fibre-restricted sodium channel may have a selective analgesic effect. Changes in the expression of tetrodotoxin-sensitive sodium channels within dorsal root ganglia neurons in inflammatory pain. Nociceptive neurons within dorsal root ganglia (DRG) express multiple voltage-gated sodium channels, of which the tetrodotoxin-resistant (TTX-R) channel Na(v)1.8 has been suggested to play a major role in inflammatory pain. Previous work has shown that acute administration of inflammatory mediators, including prostaglandin E2 (PGE2), serotonin, and adenosine, modulates TTX-R current in DRG neurons, producing increased current amplitude and a hyperpolarizing shift of its activation curve. 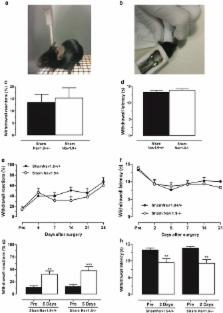 In addition, 4 days following injection of carrageenan into the hind paw, an established model of inflammatory pain, Na(v)1.8 mRNA and slowly-inactivating TTX-R current are increased in DRG neurons projecting to the affected paw. In the present study, the expression of sodium channels Na(v)1.1-Na(v)1.9 in small (< or = 25 micromdiameter) DRG neurons was examined with in situ hybridization, immunocytochemistry, Western blot and whole-cell patch-clamp methods following carrageenan injection into the peripheral projection fields of these cells. The results demonstrate that, following carrageenan injection, there is increased expression of TTX-S channels Na(v)1.3 and Na(v)1.7 and a parallel increase in TTX-S currents. The previously reported upregulation of Na(v)1.8 and slowly-inactivating TTX-R current is not accompanied by upregulation of mRNA or protein for Na(v)1.9, an additional TTX-R channel that is expressed in some DRG neurons. These observations demonstrate that chronic inflammation results in an upregulation in the expression of both TTX-S and TTX-R sodium channels, and suggest that TTX-S sodium channels may also contribute, at least in part, to pain associated with inflammation. Impaired pain sensation in mice lacking Aquaporin-1 water channels.